If you have ever wanted to know things like rates on mortgage loans or car loans you may have found the answers to your questions at www.bankrate.com. The website provides current rates on many financial products and has a goal of helping you make informed financial decisions when it comes to buying a house, a car or signing up for a credit card. It has been online since 1996 and has become one of the most trusted sources of personal financial information on the Internet today. When you read about the history of this company and the mound of information it aggregates, you can’t help but be impressed. In 1976, a company called Bank Rate Monitor produced a printed newsletter that provided bank rates for consumers in the United States. It became a recognized brand among those interested in personal finance. Twenty years later the company took it’s services online at www.BankRate.com. By 2009, Apax, a UK private equity and venture capitalist firm bought the company for $571 million dollars. Now it is attracts over 15 million unique visitors per month. 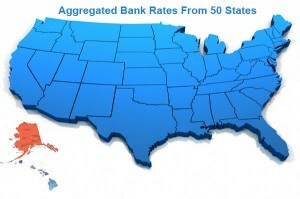 Amazingly, the site as it stands now, gets loan rates and bank data from all 50 states. Data is pulled from 4,800 banking institutions. Their primary focus is to provide consumers with information to help them with purchases of homes, automobiles, loans, CD’s, Money Market accounts and an additional 300 financial products. Their databases of information includes 172,000 individual rate tables, 30,000 stories with 155+ new articles coming out each week. They run 13 blogs which are updated 2 – 3 times per week. They conduct 9 exclusive research studies per year and offer 14 opt-in email newsletters. Their readers are educated, financially savvy and self-directed. The average FICO score for visitors is 775+. So if you visit this site on a regular basis, consider yourself in good company. Bankrate.com is often quoted in high quality financial news organizations like The Wall Street Journal, USA Today, NBC News, The New York Times, The Los Angeles Times and The Boston Globe. Their social presence on Facebook reaches 100,000+ users and on Twitter, they have 64K+ followers. They receive 7,000 social mentions on blogs and social media per month. They have 12,191,108 backlinks referring to them from other web sites with NBCnews.com using 1,295,337 links in reference to BankRate.com. The current President and CEO – Thomas R. Evans has a background as the CEO of the GeoCities. Prior to that he was President and Publisher of U.S. News & World Report, Fast Company and Atlantic Monthly Magazines. For personal finance bloggers, this company is the one to look for expert personal finance content and current rates on anything dealing with money and investing. Behind the scenes of Bankrate Inc. you see a fast growing, reliable company providing financial information for millions of people. A leader in data aggregation and the use of technology to help people in all walks of life.